These prices include GST. Please enquire for non-GST prices. These come in 7.8, 8.5 & 9mm shanks. 5 & 6 peg sets also available. These come in 12, 13, 14 or 15mm shanks. 3/4 size pegs available on special order. Saraband Music is an agent for Perfection Planetary Pegs. These geared pegs make tuning dead easy and quick, and are superbly suited to both students and professionals. They have an accurate, strong, smooth action and are stable under all conditions. They feature planetary gears of high tensile steel in a shaft of aircraft-grade aluminium and Delrin nylon. 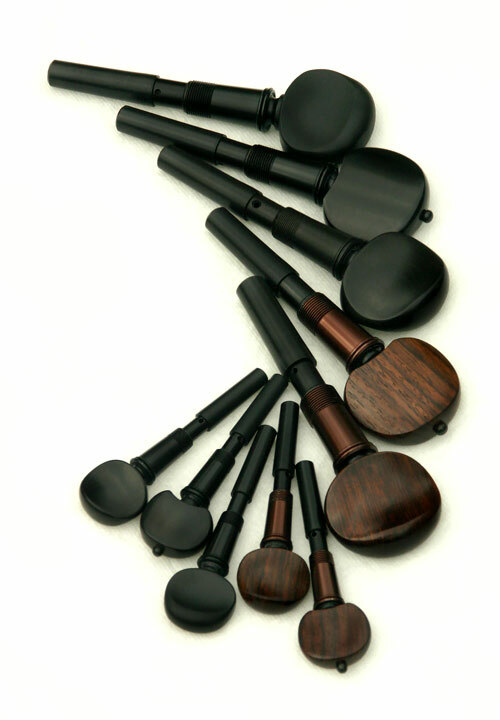 With ebony, rosewood or ABS synthetic heads, they come in sets of 4-pegs or more. Perfection pegs have a standard taper and fit in the same holes as standard wooden friction pegs. They have the same shape, weight and taper as a set of good ebony pegs. The head of a Perfection peg is made either of ebony, rosewood, or ABS synthetic (the plastic often used in car bodies). How do geared pegs work? The head is attached to the central sun gear. The section just below the head is the shank, this is made of aircraft-grade aluminium, turned, polished and anodized. When the peg is installed the shank is fixed in the peg box and remains stationary. Concealed inside the shank is a set of planetary gears that are held in place by a ring gear and driven by the central sun gear, and the brake which holds the gears in position against the tension of the strings. The gears are fashioned from the same toughened steel used for helicopter rotor-shafts. The gears give the pegs their accuracy and control, they are immensely strong, permanently sealed and lubricated and will never require maintenance. Mostly the pegs will need to be ordered in to stock, which takes a few days. There are discounts for bulk orders, such as for school music departments. Saraband Music does not install these pegs. They need to be taken to a luthier or string instrument repairer for installation.